A Trip With Her Folks Turned Barbara Bush Into A Global Activist : Goats and Soda She visited Africa with her presidential parents and found her calling. Barbara Bush talks about Global Health Corps, the group she started, and shares a "tweet of advice" for her volunteers. 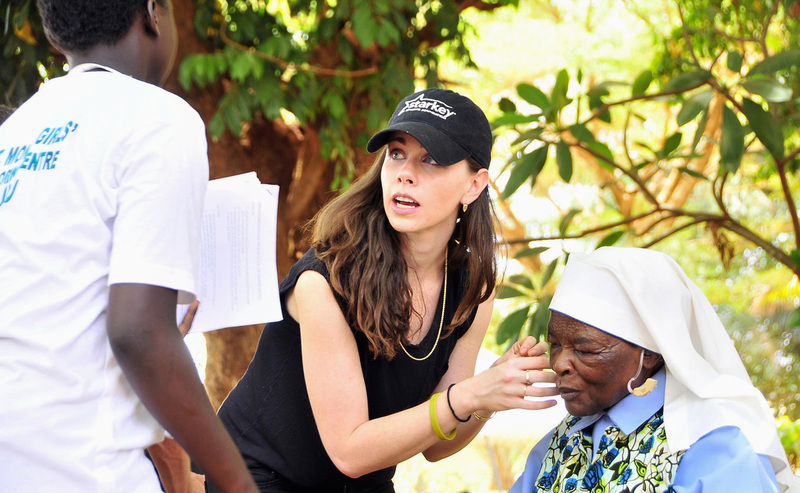 Barbara Bush helps a nun to fit on a hearing device during a 2012 event in Gulu, Uganda. She says was interested in architecture as a college student but became a global health activist after visiting East Africa with her parents. Barbara Bush may be known as the quieter of the Bush twins, but when it comes to global health, she's anything but. At 32, the Yale graduate is co-founder and CEO of Global Health Corps, a nonprofit organization that pairs young volunteers — she calls them "fellows" — with health and development organizations. They work in countries like Uganda, Malawi, Zambia and even the United States, which is not immune from global health issues, Bush reminds us. In five years, the organization has recruited nearly 500 fellows and has sent another 128 off this July. We caught up with Bush earlier this summer at the U.N., where she spoke about the role of entrepreneurs at this year's Global Accelerator conference, which discussed innovations needed to tackle issues like reproductive health, job creation and water and sanitation. She hadn't set out to work in this field, she told us. "If you'd talked to me when I was a freshman in college, I thought I would be in architecture, working in design," she said. It wasn't until the summer of 2003, right before her senior year, when she traveled across East Africa with her parents to launch the President's Emergency Plan for AIDS Relief, that her plans changed. What caught your attention in East Africa? Hundreds of people waiting in the streets for [medicines] that were readily available in the United States. That spoke to both the massive scale of the problem and also the purely inadequate systems. Was there a moment that stuck with you? In Uganda, I was talking to a woman who had brought her little beautiful daughter to the launch of PEPFAR. As I was talking to the mother, [who] had dressed her little girl up, I said, "How old is your daughter, she's so beautiful. Is she 3?" And the mom said, "No, she's 7." She was just small, not because she was young but small because she was born [HIV positive] at the wrong place at the wrong time. It was unclear whether her daughter would live that much longer but what the access to drugs meant for her daughter's future was worth this mother traveling with her daughter, to be there. Why focus on issues overseas when there are problems here in the U.S.? Actually, since we started Global Health Corps in 2009, we have fellows working in the United States. Acknowledging that global health issues affect the U.S., we started off our very first class of fellows [working] to address global health issues here. We can learn so much from what's working in other countries and apply it to the United States. Global health issues are our issues as well. We don't want it to be an us-versus-them conversation. How did your parents feel about your venture? I think they were excited that I found something I was so interested in, that I would want to spend my life [doing]. Several children of politicians are involved with global health: Chelsea Clinton, Vanessa Kerry, you and your sister. Why do you think that's the case? [Laughs] I honestly haven't thought about it. In terms of myself and my sister, we have been lucky enough to have parents who are, first of all, serving others by working in policy. We're all very lucky to have the exposure that we had to issues that are pressing. Of course my own career was shaped by getting to travel with my parents and getting to meet unbelievably influential people [such as] Wendy Kopp, who started Teach For America. Your volunteers are all 30 or younger. What advantages do young people have in the global health field? Our fellows can bring in new ways of thinking because they have fresh eyes. But also, if they're 26 years old, they can work on these issues for 30 more years. Tweet of advice to someone looking to volunteer abroad? Listen and be curious because you won't have the answers. People in the communities have the answers and you're there to learn from them.